Obsessed with the new? Our ancestors already had the answers. As James Hamblin points out in his recent cracker-jack article in The Atlantic, “New Nutrition Study Changes Nothing: Why the science of healthy eating appears confusing—but isn’t,” the term “neophilia” was coined by J. D. Salinger in 1965 to refer to our obsession with novelty. And while a degree of curiosity about what’s new is no doubt healthy, like so many things these days we seem to have taken our obsession too far — certainly with food and nutrition. As Hamblin shares, editors and publishers aren’t interested in nutrition articles that don’t have sensational headlines, preferring to focus on narratives that upend conventional wisdom. The thought seems to be, if new research doesn’t change or challenge the way readers think about the world, why is a story worth publishing? The study Hamblin writes about is the Prospective Urban Rural Epidemiology study, or PURE, the largest global study looking at environmental, societal and biological influences on obesity and chronic health conditions, with over 150,000 participants aged 35 to 70 years from 17 countries over a 6 year period, from both urban and rural communities in low-, middle-, and high-income regions of the world. The results were recently published in The Lancet. But what do the results actually show? “The practically important findings were that the healthiest people in the world had diets that are full of fruits, beans, seeds, vegetables, and whole grains, and low in refined carbohydrates and sugar” — a finding he admits would be too boring for his editor, and probably even his readers. Yawn. So what else is new? “This study confirms that the single most important risk factor for poor health is poverty. The study results are consistent with the idea that largely plant-based diets are good for health. No single study can settle the fat vs. carbohydrate debate because people eat complicated combinations of foods and diets containing those nutrients. What we really need are well designed studies of dietary patterns—the ones done to date suggest that largely plant-based diets are associated with excellent health and longevity. The James Hamlin article hit a nerve for me and many of my colleagues, largely because, hello! There is NOTHING NEW HERE. The study’s conclusions, when clearly understood, go back to pre-World War II wisdom, before big agra took over and our food climate changed dramatically in this country, with the advent of convenience foods in cans, agricultural pesticides, factory farming and everything else. Before that, people were cooking. We ate what was in season and that we could get ahold of locally. We didn’t have all these complications. Many countries included in the PURE study have integrated legumes, vegetables, nuts and seeds into their cultures for a long time, and where quality whole foods continue to be more accessible. Whether you’re looking at Costa Rica or parts of North Africa, the Mediterranean or Asia, where carbohydrates are consumed, they tend to be accompanied by healthy, whole foods. It’s a total mistake to throw the whole category of carbohydrates under the bus! You may want to reduce or eliminate refined carbohydrates (white flour pasta, bagels, etc.) but keep the vegetables and whole grains! My post "Carb Control" sheds light on the details that will help you sort out this topic. In sum, eat close to Mother Nature — and your great grandmother’s diet! Crisco was the beginning of the end. My great grandmother was using lard. Praise the lard! She was using butter. The real deal. The real question is: what works best for you? Some people thrive with legumes and whole grains. Other people, not so much. But you can never go wrong by incorporating vegetables! See my guide to falling in love with vegetables. Eat the rainbow! Add as many different colored vegetables as you can to your salad or one-dish bowl, chopped raw, roasted or sauteed. Add greens; beans or lentils, an egg, or slices fish or animal protein as a condiment; sprinkle with nuts, seeds, and chopped herbs. Bingo! You have a colorful, nutrient-dense, longevity feast! Thanks to mood-boosting nutrients, sardines are like little antidepressants in a can. That said, some culinary wizardry will be required to turn sardine skeptics into wild-eyed fans. Take my kitchen assistants, Jen and Katie. They swore they couldn’t stand sardines. I simply said, “You haven’t them the way I make them” and sent them out of the kitchen so I could perform my feat of prestidigitation. (No rabbit and top hat; just red onion, basil, parsley, mint, olive oil, and lemon juice, on a bed of arugula). Voilà! They eagerly devoured the sardines and asked for more. Now that’s the kind of magic I like to practice. Getting in the swing of eating veggies is like igniting a pilot light on a stove: it may take several tries, but once it’s lit, the flame burns steadily. 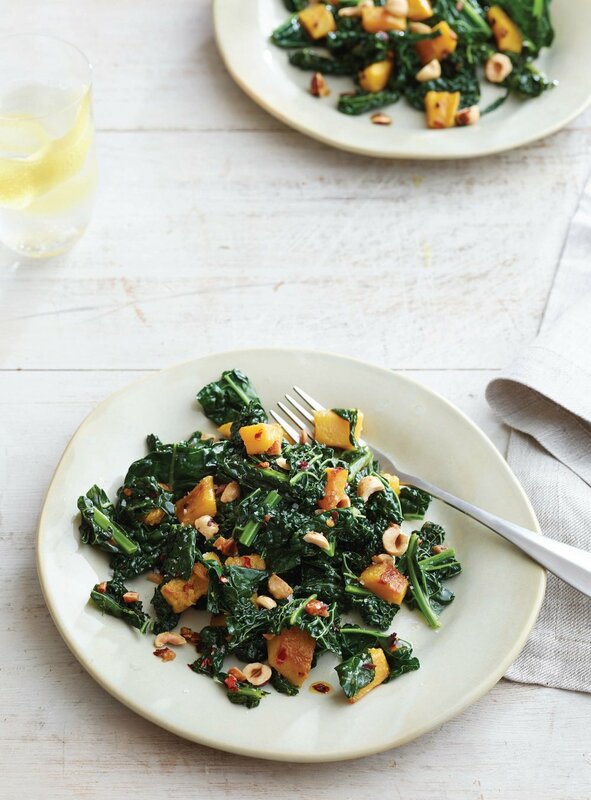 Here, I’ve paired kale with an autumn favorite, delicata squash, along with garlic, red pepper flakes, and freshly squeezed lemon juice to create a dish that’s both a delight to the eyes and the taste buds. The chopped roasted hazelnuts take the entire concoction completely over the top. It’s ablaze with flavor that will leave you burning for more! AT THE END OF THE DAY, EAT REAL FOOD, AS MUCH AS POSSIBLE. BE OBSERVANT. EAT WHAT’S RIGHT FOR YOU AND INCLUDE A DOLLOP OF COMPASSION. GUILT IS NOT NOURISHING! DO THE BEST YOU CAN, AND HONOR THAT. Good news: Fall courses sale! Purchase either course with the discount as a gift! Newer Post Start with soup!